1.Please check the LCD to make sure the flex cables are in good condition and there are no debris on the connectors. 2.Disconnect and reconnect the flex cables from the motherboard side. 3.Then Reboot: Hold buttons (Home, Up volume, and Power button) untill the phone switch down and then switch up again. 4.Leave the phone alone for a while in a dry environment. Sometimes there is static after installing that will go away,you can try to put the phone a night. 【Quality guaranteed】: Each LCD Display was double tested before shippig and working perfectly. 【Funcation】: Replace your damaged, cracked, shattered screen, or screens with display or touch response issues. 【Note】:The LCD Screen is without HOME button,ear piece and front camera,just same as the pictures. 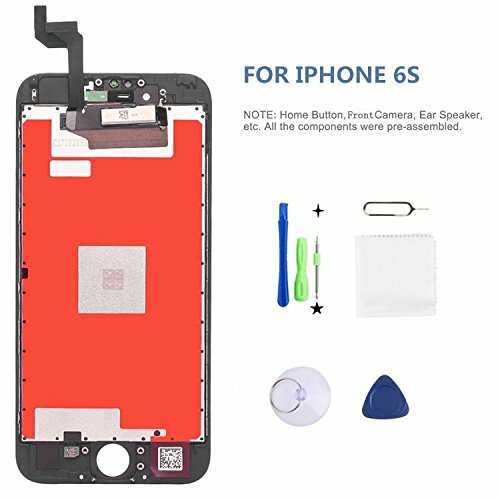 【Installation】:Please watch a YouTube operational video before install replacement screen for iPhone 6s plus. Be careful and patient can avoid some unnecessary mistakes. 【Color】The iPhone 6s LCD screen and digitizer assembly is available in black and white, and this is the black one. only compatiable with iPhone 6s (4.7 inch).